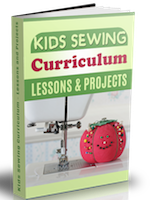 This project will teach you how to make an apron. This apron is a waist apron or a skirt apron. 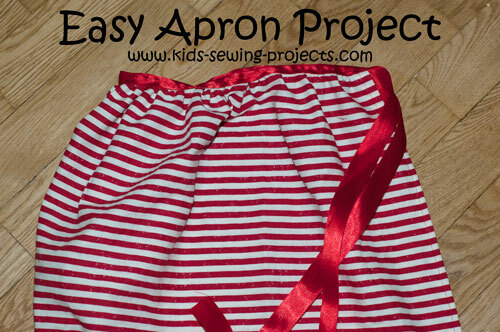 See our easy kid's apron for a bib apron or this easy sew apron project. 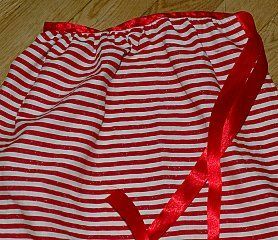 For an adult size apron use a 22 1/2 x 45 inch piece of fabric and 2 yards of 1 ½ inch ribbon. Follow the directions as above but leave 12-20 inches of ribbon on each side. 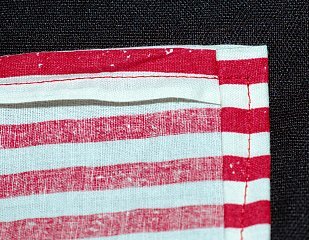 This is how to sew a hem, starting with a short side turn the edge ¼ inch down and ¼ inch down again. Pin in place. Continue all along the sides, bottom and opposite short side. Leave the last long side open for the top. Sew a straight stitch along the edges. Stop at the end to turn the corner. Place your needle down in the material and lift the presser foot. Turn your material 90 degrees. Put the presser foot down and continue sewing. Corners will look like this. Sew a gather stitch on the top edge. Find the center of your ribbon and place it on the wrong side of the material, matching up the center of the ribbon with the center of the top edge. From the center point of the ribbon, measure 6 inches on each side. Place a pin to mark the two spots. Gather the material to fit where the pins are at the end. Pin ribbon along the top, leaving enough on the top to turn ribbon down over the front side also. Stitch ribbon over the gathered top making sure you catch both layers in the stitches. Turn the ribbon down to the right side of the material and stitch over top again. 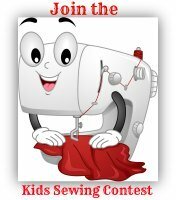 Check out our easy kid's apron. Take me to more sewing projects from How to Make an Apron.